Our education system is problematic. Now, I believe in education. I work in education. I, like most of you, believe that education, more than any other factor, is the force that can raise a man from ignorance and poverty to empowerment and opportunity. Because of this belief, I (personally) work to get students access to scholarships, we (Zinch) donate to create scholarship funds, and the government donates millions a year to higher education. But that is all part of the problem. Education has historically had a high return on investment. Competitive forces always incentivizes schools (or anyone else) to capture as much value out of a product as possible. Because students are willing to pay up to the point that their marginal return from attending school equals the marginal benefit that they will get from attending, this has allowed schools to eat into the returns of their students by raising tuition year after year. Said another way (simplified example ignoring opportunity costs), if you knew by investing $100 (NPV) you would receive back $120 (NPV) you would do the deal. If you knew that by investing $110 (NPV) you would receive back $120 (NPV) you would do the deal. If you knew that by investing $119 (NPV) you would receive back $120 (NPV) you would do the deal. 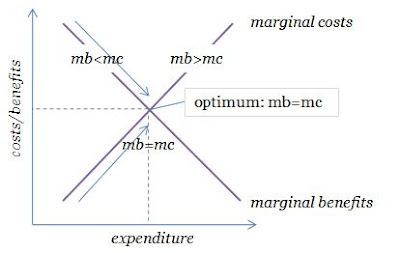 People are willing to invest up until the marginal costs (MC) equals your marginal benefit (MB), i.e. where investing $120 (NPV) gets you back $120 (NPV). While I have heard different figures, I recently read that a college grad can expect to earn approximately $300,000 more than a non-college grad over their lifetime. This means that colleges can and will continue to raise the cost of tuition. Because as long as there is still a positive return to the experience, people will continue to line up at the door. But the hikes in tuition do not affect us all equally. There are those of us who, while knowing that the return on education is still positive, don't have the capital to start, or to finish, the process of a 4-year degree. It is not that the economics don't work, it is that they don't work for all of us. With each hike in tuition, some of us get left behind. But we are a nation that believes and supports higher education. There are a lot of good people and foundations at work donating scholarships and grants to help students pay for an education. Chart number two is what we fool ourselves into thinking with every scholarship cheque that we write. We like to think that every dollar donated and gifted away is making education cheaper for students. We like to think we are helping keep tuition costs down while allowing more students the opportunity of higher education. This third chart depicts what is really happening in the market when colleges are given subsidies. The thing is, colleges have constraints, both physical (buildings, class rooms, and chairs) and non-physical (exclusivity, keeping acceptance rates low). 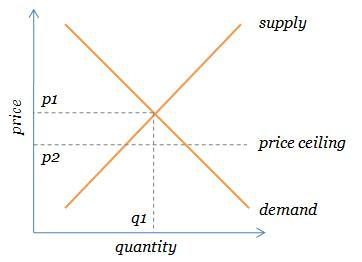 Quantity is constrained while the effective price is being driven lower by the subsidies. 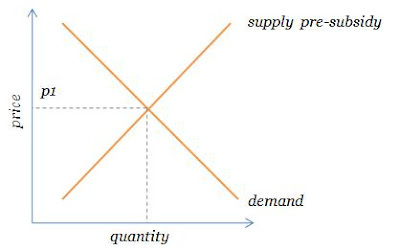 Chart four depicts the impact of the prices being held down by subsidies while constrained by the inability to increase quantity. 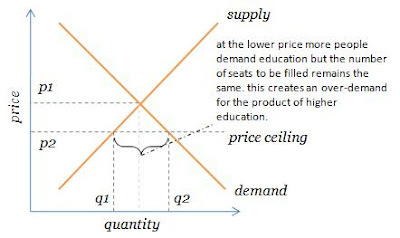 This effect is an over-demand for the product of education at that given price. At the subsidized price, more people want the product than universities can supply. Universities continue to provide at some quantity less than Q2, leaving unfulfilled demand for the product. This over demand means a lot of people want a college education. The historically high ROI continues to drive demand. We are a nation that loves education. And increasingly, we are a nation that demands education. Every middle-manager, gray-collar worker in America is expected to have a degree. It has become a base-line hurdle and pre-qualifying filter. That is the concept of degree inflation. The value and expectations that we once held of a high school diploma we now hold of a bachelors degree. This occurs for a number of reasons, one of which is the over-demand for education. As we award more and more degrees, the exclusivity and ability of that degree to differentiate a person diminish. The combination of over-demand for the product of education created by the subsidization of scholarship and grants continues to allow for creep. As mentioned above, students will purchase up to the point that their marginal benefit of education equals the marginal costs of receiving the education. The subsidization causes over demand. Over demand does not leave pressure on universities to remain competitive on costs. If you know that their is a line of people waiting to fill any open seats at the price, there leaves little pressure to try and drive costs down. Additionally, it drives little pressure to keep the product of education competitive and innovative. Same logic, when there is a line of people waiting to fill any chair, innovation is not required. Over time this has led to universities shifting funds away from teaching and into institutional research and fringe activities while allowing costs to continue to creep. The marginal costs of education has been allowed to creep. While degree inflation has allowed the marginal benefit to decrease. Subsidies create over-demand. Over-demand eliminates the need to be competitive and innovative. These forces are allowing the marginal cost of education to rise while the marginal benefit to drop. As marginal costs rise and the marginal benefit falls we will see many left behind, with diminished ROIs for those who do make it through the system. Given this analysis, there are a few things that I predict will break the cycle or hack the system. First. One of the major constraints is constrained ability of universities to educate more people. There are the physical and non-physical constraints to how many people they allow into their university each year--regardless of the costs. The system was not built to scale. But in today's world of technology, where information is free and fluid, this wall, this constraint will be torn down. 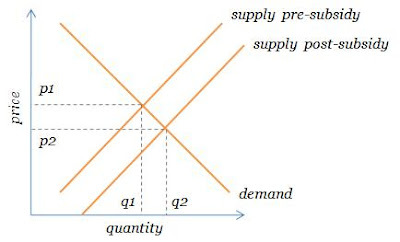 Allowing the quantity to adjust with prices, subsidies, and demand will create equilibrium in the market that will eliminate our mentioned problems. Second. As new models of education are introduced that allow for equilibrium in the market, competitive forces will return to education. (Don't get me wrong, there is competition today, between Harvard and Yale, but it is competition that is all within this model.) The competitive forces will come to be between models of education. This will drive innovation and cost effectiveness amongst all to win the business of the student. And in the meantime, don't be fooled. With every scholarship, we are helping the one, but hurting the all. We are feeding the monster and enabling the creep. The solution is not to continue to pour money into our education system. The solution is to drive a change. I believe that the change is coming that will tear down the walls of education. I believe that technology has given us the opportunity to better educate at a fraction of the costs. And I intend to help bring about this change.